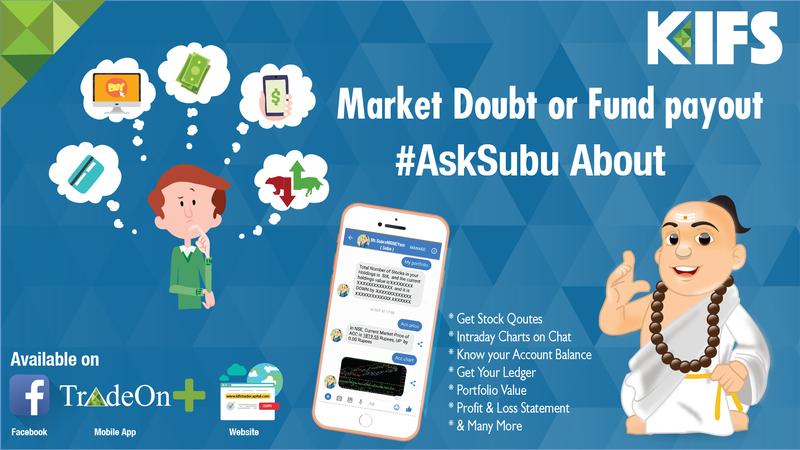 KIFS Trade Capital has the launched interactive Chatbot service, #AskSubbu. It will enable consumers to have their market, stock related queries answered via mobile chat in record breaking response time of 0.1 seconds. The Chatbot #kifsSubu empowers the customer to take seamless investment decisions based on the status of their trading accounts and available balances in their trading accounts with the company. #kifssubu will benefit more than 1.3 lakh customers. The app has interactive character SubraMONEYam as the friendly advisor. SubraMONEYam ensures that customers get the status of their transactions, key account-related information and balance instantly. The app is available for free on android and iOS. Due to increasing amount of time spent by consumers on mobile phones, KIFS launched #kifsSubu to connect with them on their preferred platform. The app will help in getting a quick update on Equity, Commodity, Currency and Global Indices and will become your ultimate partner for all the market-related queries. Nowadays investors are increasingly seeking easy-to-access stock market tools from anywhere, anytime. #kifsSubu is a new age solution app which notifies users on the stock quotes, updates on the intraday charts, shares the portfolio value and a statement on the profit and loss, etc. This app is built to our customer’s delight by engaging the latest technology to enhance the service experience.